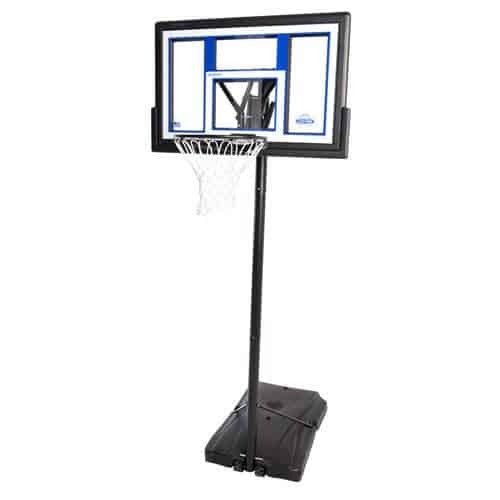 Take your basketball game to the driveway, courtyard or cul-de-sac with the Lifetime 90168 Portable Basketball Hoop. This hoop is great for family get-togethers, drills or a little friendly competition. The Lifetime 90168 Portable Basketball Hoop is portable and can be easily and instantly relocated. The Lifetime 90168 features a 48in shatterproof fusion backboard that has a pro-glass look, UV and weather-resistant graphics and a resilient polyethylene frame. This long-lasting, family-friendly unit features the Quick Adjust II height adjustment system so you can raise your goal from 8 to 10 feet to accommodate amateurs and professionals alike. The heavy-duty Slam-It rim has double-compression springs for plenty of spring-back action and an all-weather nylon net. Other exceptional features include a 3in weather-resistant pole and heavy-duty 31-gallon moveable base. No cement installation necessary with this Lifetime 90168 Portable Basketball Hoop from Lifetime Products. Just fill the portable gallon base with sand or water to provide the necessary stability. Perfect for kids, teens and adults, this is a cost efficient basketball goal that offers you the freedom to move, adjust and play wherever and however you desire. Even young players can experience the thrill of making their first shot with the rim set at 8-feet. Get years of use from your basketball system with the included 5-year, factory warranty honored by Lifetime Products. It is suitable for all ages and skill level. Not the best selection if you are looking for a competition level hoop. Check out this option if you are looking for a top of the line portable hoop. Spalding has been a leader in the game of basketball for many decades and continues to set a course which many other basketball brands follow. They arguably offer the greatest variety of basketball hoops at different price points, features, and quality. 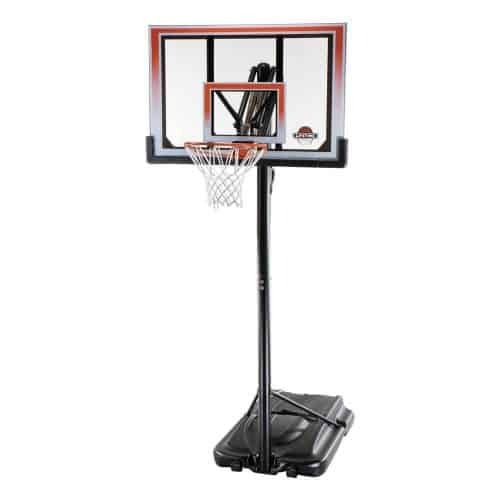 The Spalding 60″ In-Ground Basketball System is a mid-priced hoop that finds itself positioned between less expensive portable hoops like the Pro Slam and higher-end in-ground systems like the Spalding 888 system. So, if you want to take a step up from some of the more common value hoops but may not have the budget for a hoop that will set you back one or two grand, then the Spalding 60″ In-Ground Basketball System is likely to be right up your alley. The value of this hoop cannot be understated. It features a 60″ tempered glass backboard while keeping a price point under $600, a rare feat in the basketball hoop market. Tempered glass offers the best rebounding experience when compared to backboards made of acrylic or polycarbonate. The backboard also has a better more supportive design than what is more commonly seen with lower priced hoops. The rim that comes with this hoop is also a step up from other systems and is more capable of handling dunks and competitive game play. Installation of this hoop is made more simple with the ground sleeve anchor system that is included with this hoop. We see the Spalding 60″ In-Ground Basketball System as a good entry into the premium hoop game without some of the bells and whistles that are included with more expensive systems. Most notably, this hoop comes with no padding on either the support pole or the backboard. While the 2″ offset from the backboard to pole does help to keep players from getting injured, it may be worthwhile to invest in a pole pad if you decide to purchase this hoop. The Spalding 60″ In-Ground Basketball System is a great value that comes with features not matched by many hoops at its price point. This characteristic is what helped drive our rating of this hoop. We would generally recommend this hoop for families as well as those who are serious about the game of basketball and their budget. For those wanting the features of a higher priced hoop (padding, larger backboard, etc.) 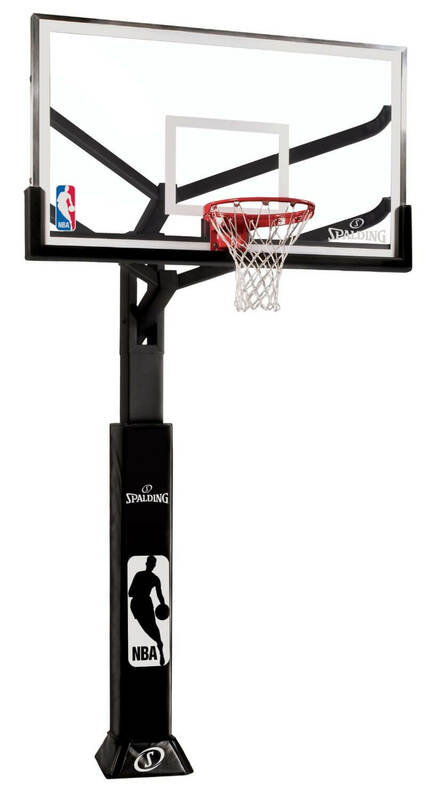 we suggest looking into the Goalrilla GLR GS-I and the Spalding Arena View Hoop. We see Lifetime as a brand that works to bring quality basketball systems to many homes by making hoops that are a good value and in the price range of the masses (except in the case of their premium Mammoth Hoops). The Lifetime 71525 In-Ground Basketball System continues this tradition as an in-ground unit that gives you good bang for your buck. This is a mid-level hoop in the Lifetime product line and comparable to the Lifetime 71566 Portable Basketball Hoop and the Lifetime 71522 Portable Hoop, which are in a similar price range and have similar features. Speaking of features, let’s take a moment to dig deeper into the Lifetime 71525 In-Ground Basketball System. The first thing you will notice is that the rim on this hoop is high quality compared to the price of this system. It comes with a double spring rim with a cover over the spring box to reduce rusting. While this is a spring loaded rim that will give when dunking, we would not recommend hanging on the rim of this hoop as it is designed more for recreational play rather than a gym quality system that is heavy-duty. We see the most prominent feature for the Lifetime 71525 In-Ground Hoop being the Power Lift pole system. Just grip the handle and move the hoop up or down, it really is that simple. This Pro Lift set up surpasses the screw-jack system in simplicity, which is more common in higher priced hoops. The hoop also includes a 54 inch backboard made of Makrolon Polycarbonate material. The positive of this type of material is that it is extremely durable and is much harder to break than tempered glass or acrylic. However, performance of a backboard made of this material leaves a little to be desired as it tends flex and come off as flimsy. There is also little backboard support as there are two steel attachments to the backboard which are focused on the rim. The main support pole is fairly standard and should suffice for the vast majority of homes looking for a good quality recreational hoop. To wrap up our review of the Lifetime 71525 Hoop, we feel that this system is perfect for families who are looking for an in-ground hoop that will provide years of recreational level performance. If you are looking for a more premium in ground option we would suggest looking at the Silverback SB-54ig or the Silverback SB-60, which are a step above in quality and price. Spalding is a major player in the manufacturing of recreational and professional level basketball hoops and has a great reputation for putting together good products. Because of this we work to review as many hoops they produce as possible so that you can make an informed decision. We would like to take a closer look at the Spalding 54 Inch Portable Basketball System with tempered glass and break down its strengths and weaknesses. Let’s take a look at the strong points of this hoop first. 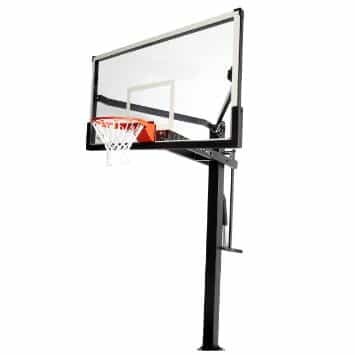 The Spalding 54 Inch Portable Basketball System comes equipped with a high quality breakaway rim that is spring loaded, and while it is not quite gym quality it will work great for the vast majority of homes. 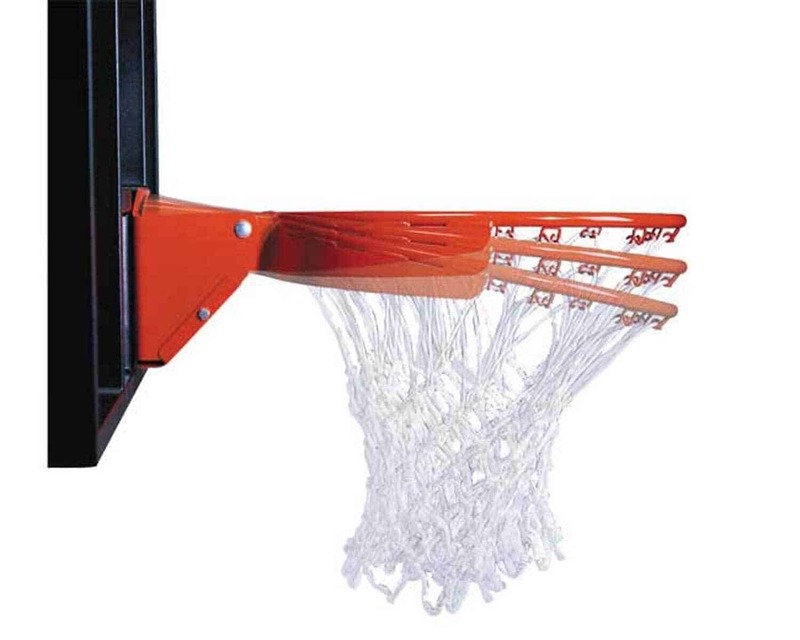 This hoop also features a tempered glass backboard, which is the highest quality backboard material allowing for the basketball to come of the backboard consistently and with appropriate force. Lastly, we really like that there are four support arms that attach the support pole to the backboard which will significantly reduce backboard vibrations when compared to hoops that have less support for the backboard. While this hoop does have some strengths it also has some serious weaknesses as well which led to our lower rating for this hoop. Our biggest concern is that the design of the Spalding 54 Inch Portable Basketball System lends itself to tipping, especially during assembly, which as a result has caused the tempered glass backboard, which is weaker than acrylic, to shatter. We believe this is related to the vertical nature in which the support pole is set on this system when compared to hoops like the Spalding Beast. It has also been reported that normal shots have caused the backboard to shatter as well. However, there are plastic spacers that are supposed to be placed between the backboard and goal which are crucial to keep this type of thing to happening to you. Spalding has begun to pre-attach these spacers, but it is recommended by us that if you do not see these spacers on your system or in the shipping box to contact Spalding to ask for them before beginning any assembly. As we discussed in our review this hoop has a tendency to tip, especially during installation. We believe this is likely due to the heavier tempered glass backboard coupled with a vertically positioned support pole. 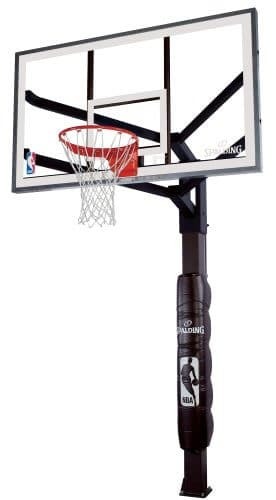 As a final note on the Spalding 54 Inch Portable Basketball Hoop, we feel that this hoop is good as it stands, however, it could be significantly better with a few minor adjustments. In particular, we believe that if the support pole was positioned at an angle that it would help stabilize the system. Because of this flaw, we feel most buyers would be better suited selecting the Spalding 60 Inch Portable Basketball System and the Spalding 68564 Portable Basketball System which are both at a similar price point. Wow, if you are crazy serious about the game of basketball and want to own the ultimate recreational basketball system for your home then look no further than the hoop we are reviewing today, the Spalding Arena View Basketball System. Spalding pulled out all the stops with this premium priced hoop and it is easy to see why this beast will put you back more than two grand. The Arena View is the top basketball hoop option from Spalding and places itself at the top of the mountain compared to some other basketball systems from Spalding such as The Beast and the 60″ portable basketball system. This hoop comes with many different options. Spalding offers Arena View hoops with either acrylic or tempered glass. While acrylic will be more durable than tempered glass, we recommend the superior performing tempered glass when investing this much in a hoop as the performance simply cannot be matched. Stability is a primary focus for the Arena View as it features Z-arms that extend from the support pole to the edges of the backboard which minimize vibrations and work to prevent the backboard from breaking. The four foot offset between the hoop and the support pole is important to keep players safe as well as recreating the feel of playing in a gym environment. The padding provided by the Arena View Basketball System is by far the best and most supportive of all the hoops we have reviewed. The support pole padding extends from the bottom of the unit while high quality padding lines the bottom of the backboard. If you put a high value on safety then you may want to take a closer look at this hoop as an option for you home. The Spalding Arena View Basketball System is one of the few outdoor hoops that can match up in quality to regulation gym systems. We like that you have the choice between a 60″ or 72″ backboard made of either acrylic or tempered glass. It allows the buyer to pick and choose the features that they value most. Installation will require three or four people and significant time due to the sheer size of this basketball system. For most, this will be more than a one day job. To summarize, if you are a basketball fanatic or an advanced player looking for optimum performance in a hoop then the high price tag should not scare you away. You will get your money’s worth with the Arena View Basketball System. However, if you want a hoop for the kids to play on or for regular recreational games then we suggest looking at hoops like the Silverback SB-60 and the Spalding Beast that are less expensive yet still provide high quality performance. This is our second review of a Silverback hoop, our first being the SB-60. Today, we take a closer look at the Silverback SB-54iG in-ground basketball system. The folks at Escalade seem to have a knack for producing great hoops and this system is no different. The Silverback SB-54iG in-ground basketball system finds its place as the little brother to the SB-60, but that by no means indicates this hoop can’t hold up in its own right. 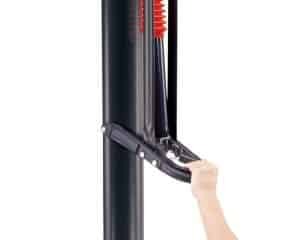 We like that the hoop provides 2″ of overhang clearance so that it plays more like a gym quality hoop. This also helps to provides protection and safety making it less likely for players to hit the pole when driving to the hoop or jumping to block a shot. Speaking of safety, the Silverback SB-54iG in-ground basketball system comes with some great features meant to keep your games safe. Some of these features include a pole pad, which generally cost $50 to $200 on their own, as well as a backboard pad to keep you from getting hurt by hitting the bottom of the backboard with your hand when going for a layup. For some more particular basketball lovers the backboard may come off as a bit small. In this case we would recommend hoops with either 60″ or 72″ backboards. The vast majority of folks looking for a great recreational quality hoop will find the Silverback SB-54iG In-ground Basketball System will certainly meet your expectations. While the hoop is not quite on par with more expensive hoop options, it is quiet a good value for the money. The major strength of this hoop is the safety pads that are included as well as the tempered glass backboard material. Overall, a really nice hoop at the mid range in-ground basketball system price point. 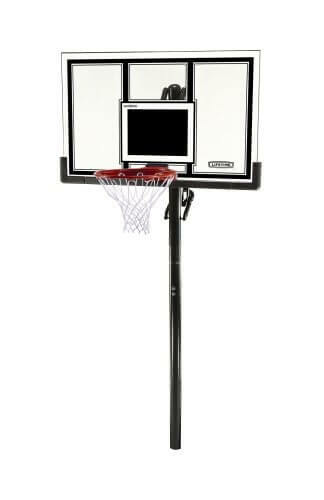 Advanced basketballers will enjoy the top grade quality provided with the Goalrilla GLR GS I In-Ground Basketball Hoop. This durable system has all the features in order that you would expect from a superior recreational basketball hoop. There are multiple characteristics that assist this hoop in standing out from the other hoop options, and in this post we will explain these features in greater detail. This Goalrilla system features a massive 72” shatter resistant glass backboard, which is designed to handle play at the highest levels. The entire hoop itself is completely rust resistant due to a DuPont powder coating that will hold up when winds blow and the rains come down. The Goalrilla GLR GS-I In-Ground Basketball System was designed for those with the purest of strokes and the highest of hops, and because of this it has been set up to be shock resistant so it can handle your patented tomahawk jams. This is on our short list for the best recreational hoop on the market. And because of this it is no surprise that this hoop will cost you a pretty penny. It’s recommended that the Goalrilla GLR GS I In-Ground Basketball Hoop be purchased and used by athletes and families who are very serious about sports and the quality of their equipment. The goal’s sturdiness stems from its 5-inch-square steel pole and its 9-by-9-inch bolt-down pattern, which is more rigid and takes up less space than portable basketball goals. Backboad is 3/8 Board includes a huge steel frame and a professional-quality foam frame pad. Rapid Cam one-handed height adjustment mechanism for speedy height changes. Are you ready to take basketball to your home at a professional level? If so you should consider purchasing the Mammoth 98862 In Ground Basketball Hoop. The Mammoth basketball system is a quality designed hoop that is made up of some great materials which will hold up even in those barn burners that come down to the final shot. The backboard is ready for permanent installation, which means that vibrations from shots are almost not existent. This hoop’s height adjustment system is easily worked with the one handed rapid cam operating system. The adjustment range is seven and a half to the regulation ten feet. There is also a key lock system that will keep the hoop at it’s current height and minimize the chances of your hoop being vandalized. The Lifetime Mammoth in ground models include an anti vibration/flex system and a bolt system that attaches to the concrete making transporting easier. The hoop is one hundred percent weather resistant, so it will hold up even in the cold winter months giving years of use. The powder coating on the steel components means the hoop will not rust. Excluding the backboard, the hoop itself is backed by a lifetime warranty in both the United States and Canada. The Mammoth 98862 In-Ground System comes with a Spring Flex rim, which is prepared to handled rim rocking slams. The 5/8-inch solid-steel rim features wraparound bracing and double-compression springs that give way during dunks to protect the player, then spring back once released. The rim is also supported by 1/2-inch braces, with welded-steel net hooks and an all-weather nylon net. Spalding is the sanctioned basketball of the National Basketball Association (NBA) and Women’s National Basketball Association (WNBA), the sanctioned backboard of the NBA and NCAA. 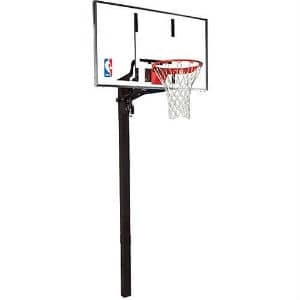 If you are an ardent basketball player, then, the Spalding H-Frame In-Ground Basketball System is a good choice for your home. This enormous hoop features a regulation sized 72″ glass backboard. It also comes in a 62″ glass backboard. The backboard is reinforced with a solid steel H-frame. A Positive Lock breakaway rim will stretch and snap back into position. The heavy duty Z-arms bolt through the backboard frame increases steadiness and levelling. The Spalding H-Frame In-Ground Basketball System is an adjustable basketball system with a rim that adjusts height from 7′ – 10′. The hardware includes plastic bushings to reduce metal contact and prevent rusting. With an interior safety stop, the board is prevented from being lowered below 6’6″. With NBA regulation size and performance, this Spalding basketball system will meet your expectations. One Piece, 6″ Square steel pole allows for maximum firmness. Ground tube anchor kit with hinging base plate allows for easy assembly. 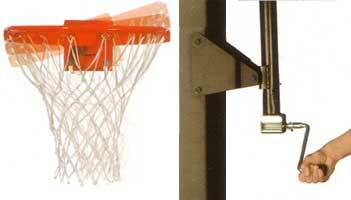 Positive Lock Breakaway rim with all-weather net. One-piece solid steel 6″ square pole. High-quality pole pad included. 72″ x 42″ steel framed glass backboard with aluminium trim. 3/8″ thick tempered glass backboard for superior rebound. U-Turn? Pro lift system provides infinite height adjustment from 7′ to 10′. 60″ x 38″ steel framed glass backboard with aluminium trim. 3/8″ thick tempered glass backboard for superior rebound. 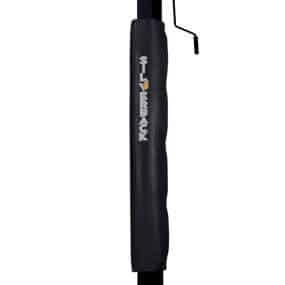 One Piece, 6″ Square steel pole allows for maximum stability. Ground tube anchor kit with hinging base plate allows for easy assembly. The Lifetime 71566 basketball hoop has a lot of great features when you consider that the system is priced under $300. The backboard is comprised of a very durable material, and the pole will not rust out due to the elements because of it being made of stainless steel. We look thoroughly for great hoops, but we have been really happy to discover this hoop because of its top quality and affordable price point. The Lifetime 71566 basketball hoop has earned our recommendation. Looking at the reviews for the Lifetime 71566 basketball hoop you quickly realize just how impressed folks are by this product. Our testers did find that the directions were unclear and this made the assembly process more difficulty than it probably should have been, however, the process became more smooth as we got through each step. A lever mechanism on the hoop allows for simple height adjustment from 7’ to 10’. The base of the hoop features wheels which make moving the hoop easier, but realize that when you fill the base with water or sand it will add 300 lbs. to the system, because of the added weight filling the base should be your final step for completing assembly. 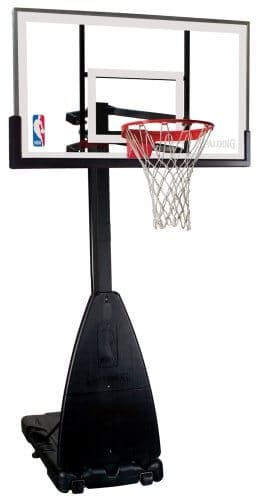 For those who are in search of a nice portable basketball hoop that will be used for mostly recreation type activities, then this hoop will be on the top of your list. For those who are in need of a professional quality hoop, then we have other options that we would recommend. Best Basketball Hoops is always happy to review Lifetime basketball hoops because of their high quality product and valued customer service. For this basketball system, we are happy to recommend this for a home with families looking to introduce the game to children for years to come. For a $300 basketball system, this just might be your best bet.